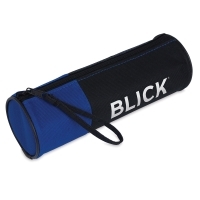 This durable cylindrical case is just the right size and shape to carry or tuck inside a backpack or tote. 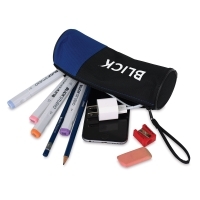 Made from a textured canvas-like material, the Blick Pencil Case has a full-size side zipper for easy access to what's inside — no more fumbling for your favorite drawing or sketching materials! The case measures 8"L × 2-2/3"Dia and holds up to 48 graphite pencils, colored pencils, or a combination of pencils and other tools. It features a two-tone Black/Blue design and reinforced edges.